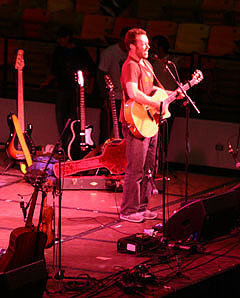 October 19, 2006 | The floor was bouncing and the roof was rising as 2,500 people gathered to listen to Isaac Hayden and Ryan Shupe and the Rubber Band, and to support and the Pauni family at a concert Wednesday night in the Spectrum. 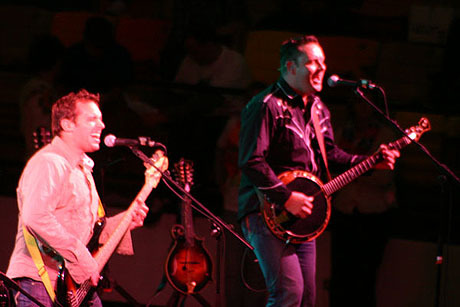 The concert raised more than $11,000 to help the Paunis pay off their mortgage. ABC's Extreme Makeover: Home Edition has been in Logan since Sunday morning when the crew woke up members of the Pauni family with the news they would be receiving a new home courtesy of Kartchner Homes, ABC and other donors. The Paunis are a single-parent family with nine children and one nephew living at home. The father, Dan Pauni, died in 2004 of a heart attack. 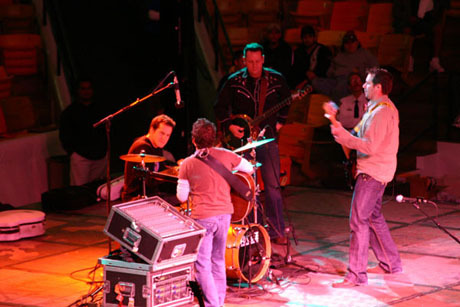 The concert was one in a series of events to help the family. It kicked off Wednesday with Isaac Hayden, a 25-year-old singer-songwriter from Jackson Hole, Wyo. He played a handful of songs, some of his own creation and some old favorites that had the crowd cheering, clapping and systematically waving cell phones. "You guys are crazy," Hayden shouted from the stage. "You Loganites are nuts!" Next was Ryan Shupe and the Rubber Band. After a rap introduction of the band by one of the band's local friends, Russ Dixon, Shupe and the boys kicked the concert into high gear with their renditions of The Devil Went Down to Georgia, and some other favorite, including the theme from the cartoon SpongeBob SquarePants. The band also hosted a sing along with one of its own songs dedicated to corn dogs. "Corn dogs! Corn dogs!" The crowd sang. "They're good when they're hot. They're good when they're cold. They're good when they're fresh. They're good when they're old." "We're now all dumber for singing that song," Shupe said. The show also included choreography Shupe said was inspired by "New Kids on the Block videos," and some clogging by Craig the banjo player. The crowd brought the band back for an encore. The general feeling was excitement, as the whole room bounced with the beat. "We love you, Ryan!" echoed the shouts from the crowd. "I love you more," Shupe answered. Many students were excited to see Shupe and his band back in Logan, along with Extreme Makeover. "It's a great cause and I love Ryan Shupe a lot," said Sara Green, a freshman majoring in special education. "It's really pretty awesome that [Extreme Makeover] is here. I never expected that to happen." The bands seemed to share the same sentiment. "We're honored to be up here playing in this show," Shupe said to the crowd. "It's great to be part of such a good cause." In between numbers, the host, Dave Ackerman, told jokes, did magic tricks and kept the crowd pumped. "How great is it to be here for this cause tonight?" Ackerman yelled. "Cache Valley is unique because it does [service] consistently." The evening wound down with a raffle, supported by several players from the REAL Salt Lake major-league soccer team. Icon Health and Fitness donated an elliptical machine to raffle. There were also donations of a barbecue grill, Dutch ovens and tickets to Wise Guys in Salt Lake City. After the raffle, Polynesian dancers performed. The Paunis' new home is expected to be completed Sunday morning. The building site is on 400 East Street just off 1000 North. To make a donation or for more information on how to help the family, visit the donation stations at the end of the street near the site or the donation tables in the Taggart Student Center.